I am an unashamed gossip. Gossip to me is the spice of life, a valuable tool of information, and the oil that greases human relations. Years ago I was shocked when an acquaintance said to me in reply to my query, ‘what’s going on for her?’ – “I’ve given up gossip”. I was so taken aback that I retreated, feeling in-adequate and really rather nasty, as though I had been caught out in some secret disreputable, or unmentionable sin. I thought about it for some days, and then my common sense re-asserted itself. If someone didn’t pass on to me that a mutual acquaintance had a life threatening illness then I could miss out on the chance to support them. If someone didn’t tell me a couple were breaking up, I could tactlessly invite the couple for dinner, and rub salt in their wounds with my ignorance. If I didn’t know that a child had gone off the rails or was in hospital I could be blithely unconscious of their need for help, whether emotional support or a hot meal delivered to a family under stress. Too often gossip is confused with back-biting, whereas to me, gossip is passing on information that is useful or even valuable in our inter-actions with each other. And there’s another aspect to gossip – not just useful vital information that enables us to respond appropriately, but sometimes it also gives innocent pleasure ! Yes, I remember the fascination with which I listened to the story of a party where two guests had had a row, and one had tipped a glass over the other…and wished I had been there to see it… drama always happens when I’m in the next room, I felt. So is this voyeurism or schadenfreude I asked myself? And I also remember reading years ago, that Lord Butler, an English stateman who knew the Queen, reported that like ‘all intelligent women’, she enjoyed gossip. First, I was delighted to think that an enjoyment of good gossip was almost a virtue, and meant that I was intelligent, but it also made me look at what gossip actually is. It’s the tiny facets of personality or of life that can illuminate a whole character, or light up a situation by showing the human interest behind the dry bones of fact. When reading history, it’s the delicious details of human conduct that rivet me – reading that Charles 11 loved his cavalier King Charles spaniels so much that he allowed them to whelp in his own sumptuous four posters beds… causing distaste and disgust among his courtiers – ‘God bless the King and damn his dogs,’ one quipped. This gossip made me love him. I loved to read of George V fulminating about his son wearing ‘vulgar turn-ups’ on his trousers, and loud checks, and Queen Victoria complaining about her second son’s sartorial habits too. Even better is the unexpected and almost outrageous, like hearing of the love between Nehru and Lady Mountbatten, which gossip had informed me of long before the current spate of film and biography. Just knowing that this beautiful high -minded man who ruled India, had fallen in love with the elegant witty aristocrat married to the semi- royal Viceroy, made them both so much more human, and therefore interesting. To read that she was found dead with all his letters opened on her bed, to be re-read before she went to sleep, and that the heart- broken statesman had sent a destroyer to her committal beneath the sea, to sprinkle showers of marigold petals on her coffin as it sank beneath the waves, was beautiful. And to discover that the Queen Mother – who gossip tells us had a wicked tongue – quipped that: “dear Edwina always liked to make a splash,” gave me another frisson of pleasure. This is gossip as fun. But gossip is also the passing on of important information that we may need. Not the cruel behind their backs stuff, but the details that may help us all. We can be kinder and more tolerant or even forgiving, if we know the pain or difficulties behind some-one’s inconsiderate or strange behaviour. Women have a well-deserved reputation for gossip, but it’s often this sort of passing on of useful information. On the other hand when I was the only girl in an all-male officers mess, I was shocked at the sometimes cruel and careless gossipy remarks of the men I overheard. Yet my experience of living in an all-female community had been that kindness was acceptable, but catty comments were not. So yes, I am a defender of the art of gossip…I relish the flashes of insight which an apt morsel of gossip can bestow. This is not gossip as slander, back-biting, envy, jealousy or small mindedness that so many arbiters of human nature have condemned. This is gossip demonstrating the endless fascination of human nature, and as an aid to understanding ‘what’s going on’ for each other. And if, as Socrates said, strong minds discuss ideas, average minds discuss events, weak minds discuss people, there speaks a man who doesn’t understand the value of emotional ties and the genuine connections between people which make the world go round. We were meeting friends off the ferry, half an hour’s drive away, and bringing them back home for lunch. Which meant being organised. So while a hot winter’s lunch was heating up in the oven, I needed a little something to keep them going. So spicy pumpkin soup which could be quickly re-heated, it was. Steam chunks of pumpkin, and scrape it off the skin when soft. Fry some onions and garlic until soft, and add the pumpkin. In the whizzer put portions of this mixture, adding enough warm chicken stock to make a thick smooth mixture, and then return to the pan. Add salt and pepper and either nutmeg or curry powder to taste, and heat it up. Just before serving, add cream to taste, and serve with fingers of crisp crunchy fried bread, fried in olive oil or hot fat. Turn but a stone and start a wing! That miss the many-splendored thing. Simple pleasures- they may not be what you think ! For some it’s a nice hot bath, for others it’s sitting in front of a roaring log fire – surely one of the most primeval pleasures – so what are your simple pleasures? One of mine is a hot croissant eaten with unsalted butter, good apricot jam, accompanied by a pot of freshly made coffee, and delivered to me in bed… perhaps not so simple, given the various components required to deliver this perfection! 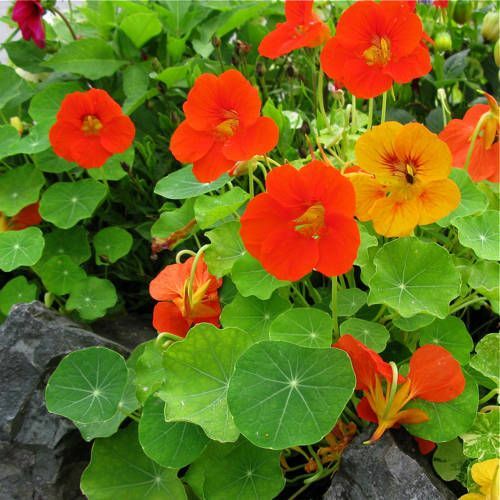 Then there is the simple pleasure of sitting in the sun on the garden bench by the profusion of rambling nasturtiums, and gently feeling beneath the round flat leaves to find the clusters of green ribbed seeds left by the flowers that have bloomed… my harvest to sow for next year’s pleasure. These thoughts were prompted by browsing through one of my favourite books which positively encourages hedonism, though hedonism of the sweetest, simplest kind… most of these simple pleasures cost nothing. It’s an anthology by sixty fine writers, and they’ve given their thoughts and services to the National Trust, the body which maintains and protects historic sites and buildings in England. So since one of the simple pleasures of reading an anthology is flicking back and forth, sampling the joys and wonders it holds, I dive into a page which reads: …’and as you take the long single track road snaking down the shady side of Inkpen Beacon, it’s as though you feel the centuries fall away behind you. ‘You pass the ramparts of an Iron Age fort, and then the gibbet on the Beacon, a reminder of the eighteenth century. You twist between hawthorne and wild brambles, and now you’re in Civil War Britain. Pass the old church, and you’re back in Norman times. Then in the village itself, there are flinty tracks and beech hedges, and what Orwell in exasperation called the deep, deep sleep of the English countryside … an unspoilt, timeless view of fields, safely grazing sheep and the sound of rooks chattering contentiously in the beech trees overhanging the lane …old Wessex, Alfred’s ancient kingdom…. Watership Down just over the hill…King Charles fought the battle of Newbury in nearby fields’ … this from Robert McCrum who has written a book on P.G.Wodehouse amongst others. Alain de Botton, I learn, having enjoyed many of his books, is also the founder of two organisations, Living Architecture and The School of Life, the first dedicated to promoting beauty, and the second to wisdom – oh Yes !!! As I flick the pages of this tiny book – five inches by three and a half – Christmas stocking size, which I bought six copies of to give to friends, I can’t resist ‘Gossip’, written by journalist Sarah Sands. She discovers by chance that historian Simon Schama is ’an A-grade gossip’. ‘How exciting that a man of such an elevated mind is happy to trade in gossip as well as ideas… Gossip is what makes a great historian a delightful dinner companion… the bond of intimacy. One shares gossip as one should share good wine. It is an act of pleasure. The two most thought-provoking of these simple pleasures come at the end of this delicious little book. Historian Anthony Seldon was the headmaster of Wellington College when he wrote his essay. Wellington College is one of the tougher English private schools. I wonder if he changed that reputation, for he writes of the joys of meditation and yoga. Sue Crewe has edited the splendid magazine English House and Garden with zest and skill since 1994 – not the sort of person I would have expected to write the exquisite little gem that ends this book. Over the years I’ve followed from afar her career, and noted that she had had what she bravely describes as a ‘period of turbulence’, and which I knew had been full of heartbreak. She describes how a friend gave her a little book in which she had to write five things she was grateful for, every day. A simple practice which over the years has grown into what she describes as ‘several feet of bookshelves’. She tells how for the first five years she kept to the five one-liners, and how at first she groped for entries, and fell back on being grateful for her warm bed, or being well fed. Then she felt brave enough to branch out into what she calls ‘free-range gratitude diary-keeping’ and expanded her thoughts. On this glorious note, one of my favourite books ends… full of such simple pleasures, those which don’t just add joy to life, but also enlightenment. I feel nothing but gratitude to all these writers when I re-read this little book yet again… and gratitude too, for the reminder of the power of words. The right words can transform our own thoughts and lives, and this reminder of the power of words, reminds me too, of the power of our blogs – each one mostly written with pleasure, and with words from the heart, to reach other hearts in that extraordinary network of friends and souls around the world. Simple Pleasures – Little things that make life worth living. Published by Random House. Made a pile of ham sandwiches for lunch, and some were left over. My thrifty soul decided to wrap them tightly in silver foil and store them in the fridge to have for supper that night. But I forgot, and several days later found this anonymous packet of foil on a shelf with butter and yogurt. Cautiously opening it, I discovered the now somewhat stale ham sandwiches. Undeterred, I decided it was ham sandwiches for me that night. I dunked them in egg like French toast and fried them in a little olive oil and butter. They were absolutely delicious – the best way to have ham sandwiches!! !